The 31st Festival Mix of the Gay, Lesbian and Queer culture cinema ended last Sunday. 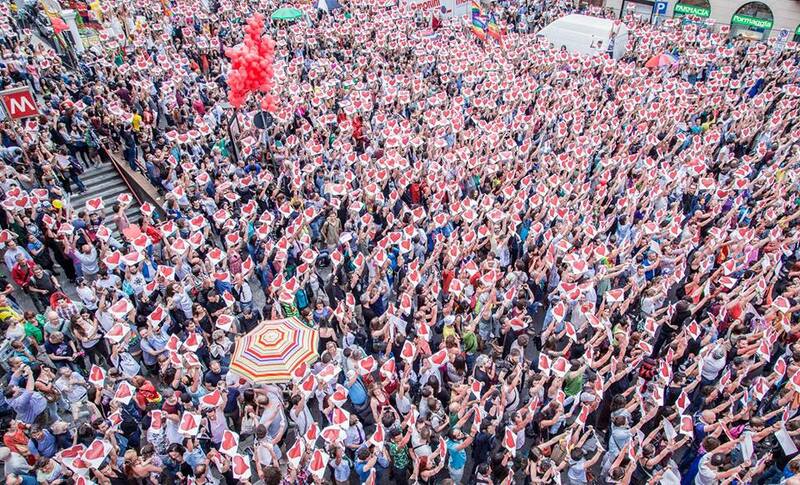 For four days, it gathered thousands of people in the Piccolo Teatro Strehler in Milan, who shared the slogan “More & More Love”. This Festival is an event that has been going on for decades, involving every year the LGBTQ community from Milan and beyond. It represents a moment to reflect on current issues, but also to have fun for those who seek a break from the frenetic pace of the city. This event is one of the several initiatives that take place during the “Pride Week”: from the 17th to the 24th of June, the city plunges into a rainbow week, which will end with the final parade from Piazza Duca d’Aosta to Porta Venezia, the most gay-friendly neighborhood in Milan. In 2017, the common theme of the films that were presented at the Festival was adolescence: “We adults have to stand beside teenagers, to prevent them from suffering traumas that can have consequences in the future” says Rafael, one of the tireless organisers, during the final prize-giving ceremony. Four films have been awarded for each category: the Jury has chosen “Heartstone” for the category of feature films, “Moonlight” for the shorts, “Brothers of the Night” for the documentaries, while “Center of my world” has won the audience award. Among the special mentions by the Jury, one in particular intertwines two themes that we care about: refugees and LGBT rights. We are talking about “Mukwano”, a Danish short film directed by Cecilie McNair, which in twenty minutes tells a story that touched the heart not only of the judges, but also of the audience. Mukwano Teaser from Sine Vadstrup Brooker on Vimeo. Mary Kabufufu is the protagonist: she is Ugandan, she is in – sometimes colorful – pigtails that show her shaved hair on one side, she has a shy downward-facing look and a trembling voice. Accompanied by the operator who takes care of her, she shows up at the Refugee Office, somewhere in Denmark, to seek asylum. The reason for her asylum application is the possibility to be reunited with her girlfriend, whom she has not seen for two years. Both had in fact decided to flee from Kampala because the local community did not accept their love: someone had even entered their house and written “devils” on the walls of their apartment. It was not enough to contact the police: instead, the girls were taken to prison, where Mary was placed in the men’s ward – and the door of her cell was left open. Mary and her girlfriend manage to escape, but their flights to Europe take off on different days, so the two lose sight of each other. During the interview that aims to assess Mary’s asylum claim, a member of the Commission urges her with irritating, uncomfortable questions. These questions somehow show an approach of constant suspicion – which perhaps represents a more general hostile attitude that too often characterises the societies that are supposed to welcome. The unexpected ending, however, overturns the story, lighting a glimmer of hope in the eyes of Mary and in the heart of the audience. And #RightsWithoutBorders is precisely the slogan of the Milano Pride, which will take place next Saturday, at the end of a week full of events. On Saturday we will be there, right at the beginning of the procession, with a banner that says “Refugees Welcome”. Because “rights belong to people, while borders cause discrimination”.